I was flipping back and forth between Whitney Houston’s funeral on CNN and a college basketball game on ESPN when I noticed something very strange. At first, I thought I was mistaken, but, no, there it was, just to the left of the preacher’s podium in the New Hope Baptist Church: a blue go cup. Seriously, who in the world would have brought a go cup into the church? And, more importantly, what was in it? There was a cruel irony in thinking that someone brought a Bloody Mary to Whitney Houston’s funeral. And to display it so brazenly! I know it was a long service, but that’s why you own a petite silver flask. For those of you unfamiliar with the term “go cup,” let me explain. A “go cup” is Southern slang for a plastic cup used to hold a beverage—often alcoholic—and then carried with you when you go somewhere. Some people refer to them as “cruisers” or “travelers.” Still others call them “solo cups,” a nod to the Solo Cup Company which started producing the ubiquitous red plastic drinking cup back in the 1970s. Before becoming known for party cups, Solo developed wax-lined cups for drive-in movies and fast food joints in the 1950s and small paper cones for office water coolers in the 1940s. Today, the company produces a wide variety of plastic and paper products and boasts annual sales of about $1.6 billion. That’s a lot of go cups. Red cups make up sixty percent of Solo’s party cup sales. Blue cups are a distant second. The company has conducted a lot of market research on color and they believe the preference is because the color red appeals to both men and women. Red also signifies concepts like energy and passion, while blue is linked with tranquility and depth. Do you think that’s why red is associated with Republicans and blue with Democrats? Politics aside, I’m a fan of the classic red go cup. Blue will work in a pinch, as will yellow, but for some reason, a drink just doesn’t taste as good as it does in red. What goes best in a red go cup? All fizzy drinks, and that includes champagne. Screwdrivers, Bloody Marys, and Margaritas, of course. Wine, however, should not be served in a red plastic cup. Neither should a martini or a manhattan. And, don’t even think about handing someone a Cosmopolitan in a red go cup. That’s just gauche. Beer, of course, is ideally suited for the red go cup, so much so that the red plastic cup is the official cup of college keg parties and beer drinking games like flip cup and pong. More recently, this American party staple has even become the subject of a new song by Toby Keith: Red Solo cup, I fill you up…Let’s have a party. Despite its reputation and some really bad lyrics, the red go cup is not about merely getting drunk or trying to sneak something somewhere. It’s also about living the moment and taking that moment with you. It’s about freedom and the outdoors. One of my favorite things to do after a day on the beach is to mix a rum and Coke and then go tend my garden, red cup in hand. For me, the go cup also symbolizes the past, the days of station wagons with wood paneling, Polo cologne, and good FM radio. Back when the Republicans weren’t so scary and before the people you knew and loved began to die. A friend’s sister paints pictures of go cups in all colors. 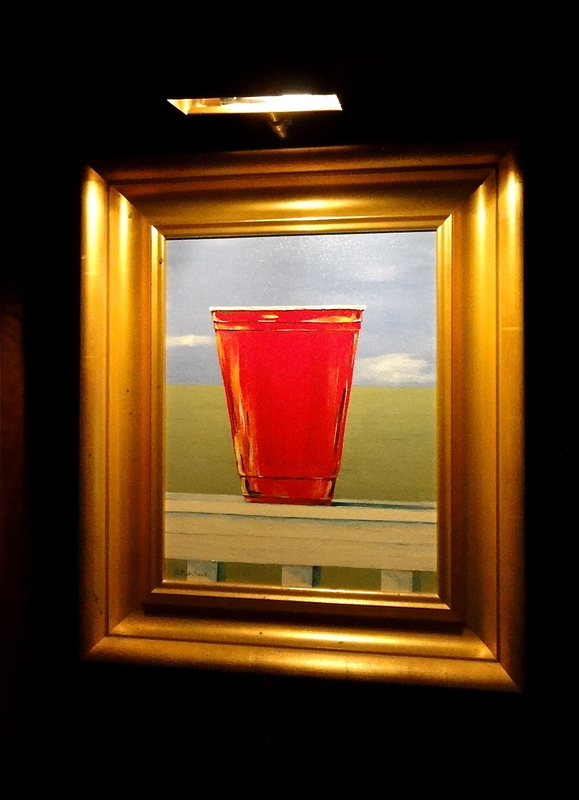 I have a red one, framed and lit in my cottage. When I ask her why the go cup, she shrugs and says she admires its simplicity and aesthetic. She likes how it makes people smile. In retrospect, perhaps a blue go cup at a funeral isn’t such a bad idea after all.